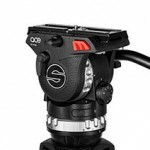 Sachtler Ace M Fluid Head & Tripod Systems - With its payload range of 0 to 4 kilograms (0 to 8.8 lbs), Ace is the ideal camera support for smaller HDV camcorders and DSLR cameras. -The 5-step counterbalance (+0) makes fast counterbalancing of the camera set-up easy. With 3 vertical and 3 horizontal grades of drag (+0), the new patented SA dragTM enables fine adjustment for precise panning and tilting. 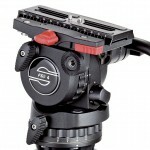 The new Sachtler Ace fluid head has a tilt range of +90° to -75°. For Ace, a glass fiber reinforced composite material was chosen, which makes the new 75mm fluid head especially light and offers a comfortable and non-slip surface feel. Ace is delivered with the Ace plate. It comes with a 1/4” screw and pin. Spare camera screws (1/4” and 3/8”) are stored in the balance plate. Sachtler Ace L Fluid Head & Tripod Systems - Due to its payload range of 0 to 6 kilograms Ace L is very versatile: Be it a shooting with a lightweight video enabled DSLR camera, a heavier rig with accessories or a HDV camcorder. A counterbalance of 7 steps allows rapid balancing of the camera set-up whereas the patented SA drag™ provides fine adjustment for precise panning and tilting. 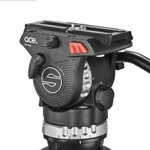 The new Sachtler Ace fluid head has a tilt range of +90° to -75°. For Ace, a glass fiber reinforced composite material was chosen, which makes the new 75mm fluid head especially light and offers a comfortable and non-slip surface feel. An illuminated bubble makes work with Sachtler Ace L even more convenient. Ace L is available with a choice of different lightweight carbon fiber tripods allowing a variety of different configurations. All of them are delivered with the Ace plate. Each system comes with a 1/4” screw and pin. Spare camera screws (1/4” and 3/8”) are stored within the balance plate. Sachtler FSB 4 Fluid Head - This fluid head with its payload of 0-4 kg (8.8 lb) is the ideal device for users of small and lightweight (H)DV cameras which are equipped with professional accessories. The FSB 4 offers functional Sachtler features such as a robust aluminum housing and the proven Sachtler Speedbalance technology for swift balancing. Its three horizontal and three vertical grades of damping, the reliable five-step counterbalance as well as its integrated flat base fitting, guarantee ideal handling qualities. The FSB 4 works with tripods with a 75 mm bowl. Sachtler FSB 6 Fluid Head & SOOM System - Sensitive, fast and robust – a small head for awesome shots: Perfectly designed for all users of MiniDV and (H)DV cameras, Sachtler’s new fluid head has a payload ranging from 1,5 to 8 kg / 3.3 to 17.6 lbs. The FSB 6 is the only in its class to feature Sachtler’s Snap & Go sideload mechanism which boasts an exceptionally large sliding range of 120 mm / 4.7“ and 10-step counterbalance. This ensures extremely fine and fast balancing. Alternatively, the head is also available with the classic Touch & Go camera plate. The FSB 6 offers three horizontal and three vertical grades of drag plus 0. No compromises have been made with regard to the damping, which is based on the same construction principles as the „large“ heads. Sachtler’s new fluid head FSB 6 and the FSB CELL are all components of the SOOM modular construction system. 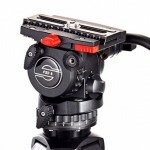 Sachtler FSB 8 Fluid Head & SOOM System - Quality for (H)DV-Users: The FSB 8. The sturdy and reliable FSB 8 completes Sachtler’s FSB-Range of 75mm heads, extending the payload range to 19.8 lbs (9 kg), well suited for (H)DV camcorders in industrial, newsgathering and education applications. The FSB 8 provides a 10-stage counterbalance, as well as five steps of drag (plus 0) for both tilt and pan. The fluid head is engineered with Sachtler’s well-known technology, including its patented counterbalance switch mechanism, Speedbalance and Sideload technology, which allows quick mounting and unmounting of the camcorder for on-the-go assignments.